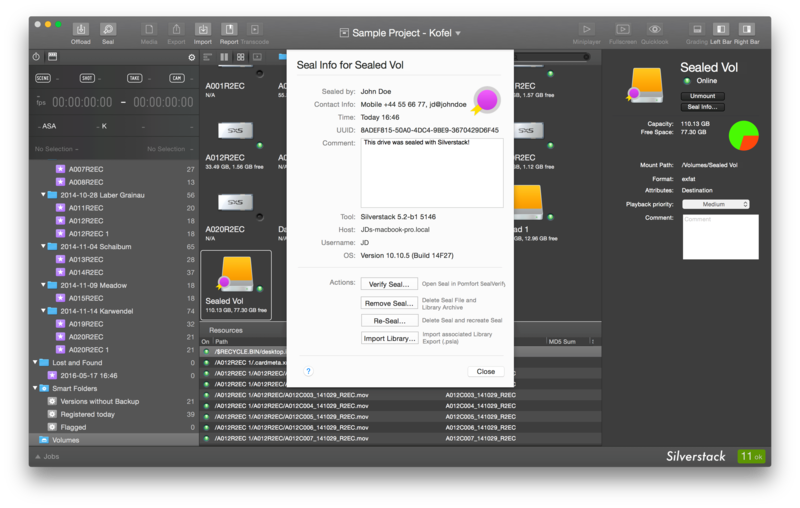 The sealing functionality allows Silverstack to make a full inventory list of a drive. This is important, not only to assure that the content of a drive is identical to the source material but also to make sure that the content on a drive is complete and reflects the intention of the sender. By sealing drives as well as directories the whole content becomes registered to notice any change inside the folder in the future. The sealing process enables you to use the free tool Pomfort SealVerify to verify the consistency and completeness of a drive at any generation later without having access to the original media. Silverstack allows you to seal volumes as well as folders. For simplicity reasons we may only refer to “sealed volumes” or “sealed drives” below but want to make clear that the same procedure will work for sealed folders. What Does the Sealing Do ? The sealing procedure bases upon the existing and widely used MHL technology and extends its functionalities. During the sealing process Silverstack writes a .pfsl file on the drive which we refer to as the “Seal”. This seal keeps all content information together and ensures that every change to the seal itself or any referenced information can be detected at any time. The free application Pomfort SealVerify can be used to easily verify the integrity of a sealed drive. To learn more about the Pomfort Seal please visit the article Understanding the Pomfort Seal. To seal a folder go to the main menu and choose “File > Seal > Folder…”. After choosing the intended folder the sealing wizard will guide you through the process. The list shows all attached volumes that have been used as a destination in the current project. The button may be disabled if no such volume is attached. Fig. 3: The first step of the sealing process. Put a Sealed Library Archive on the sealed drive. Learn more about Sealed Library Archives from the article Importing Sealed Library Archives in Silverstack XT. Put a “How To Verify This Drive”-PDF on the drive. It contains information for the receiver of the sealed volume and explains how he will be able to verify the drive. Additionally you can can enter information that will be transmitted along with the Seal Info and will e.g. be readable by Pomfort SealVerify or when Importing a Sealed Library Archive in Silverstack XT. Contact info like e.g. phone number or email address etc. Enter the information accurately to make sure the receiver of a sealed drive will be able to receive extensive information and can contact you in case of a problem. Silverstack scans the drive for files that have not been copied with Silverstack and therefore are not referenced in any MHL file. Those files are collected and ingested into an automatically generated folder called “Lost and Found” inside the Silverstack library. Like this, the files will also be registered within an MHL file that will be placed on the drive. Please note that the “Lost and Found” items will be referenced by file size only. It is recommended to copy all content with Silverstack to obtain maximum security with checksum verification. After as successful sealing process the Silverstack library will contain the complete content of the sealed drive or directory. The library export option will place a Silverstack library file (.psla) on the drive. By using the library import option in Silverstack XT, an identical Silverstack library containing the complete and verified content of a drive can be guaranteed. The verification of the content can be handled by the free application Pomfort SealVerify. Seals can be verified and checked for integrity with the free application Pomfort SealVerify. Please visit the KnowledgeBase section about Pomfort SealVerify for more information or download here. If you are looking for a way to import sealed drives in Silverstack XT please refer to the article Importing Sealed Library Archives in Silverstack XT. Fig. 4: The Silverstack volumes panel with the Seal Info. Verify Seal: When you have Pomfort Seal Verify installed you will be able to verify the integrity of the seal. 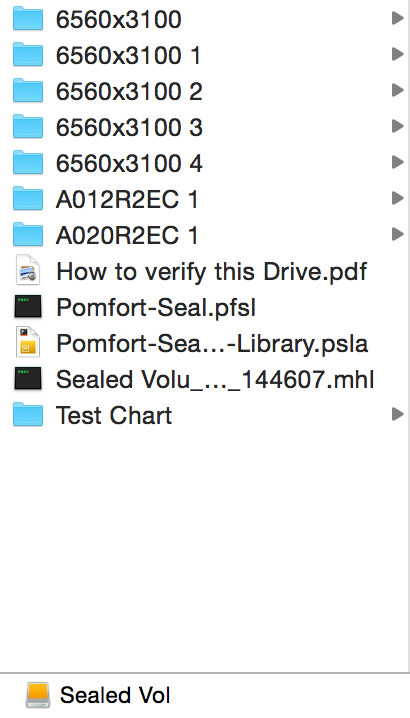 Click the button to open the drive in Pomfort SealVerify. 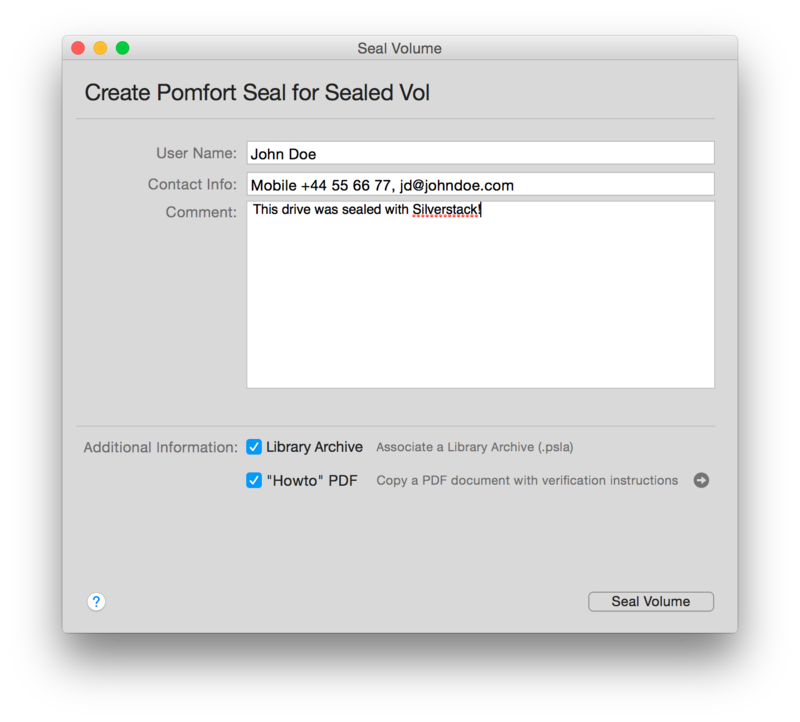 Remove Seal: You can delete the Pomfort Seal file and the Seal Library Archive. Re-Seal: Delete the seal and recreate a new one with your own seal information. Import Library: Import the associated Sealed Library Archive (.psla) that populates a Silverstack Library containing the complete content of the sealed drive or folder. Or click “Close” to leave the seal information again.